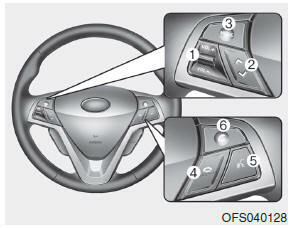 The steering wheel audio remote control switch is installed to promote safe driving. Do not operate the audio remote control switches simultaneously. Press this button briefly to reject a call during a call. • Press this button briefly to take a call when there is an incoming call. • Press this button briefly to make a call from last calls. • Press this button lengthy to switch the sound path during a call. • Press this button to start the voice recognition mode. • Press the button one more to cancel voice commands while the voice recognition is active.